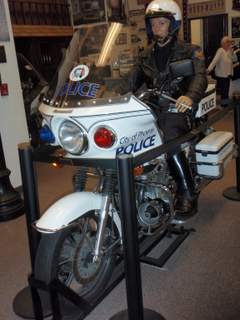 What's at the Phoenix Police Museum? 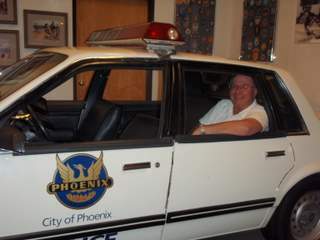 When you are downtown and have a lunch hour you can visit the Phoenix Police Museum and see some interesting things in just 15 minutes. And this is a FREE museum at the time of this writing; donations are welcome in a small wood box near the front door. The museum is located on the first floor of the Historic City Hall. There is a main Metro link right next to it on 1st Avenue and Jefferson Street. The current hours of the museum according to their website is open Monday through Saturday from 9 AM to 3 PM. There are interesting exhibits like the shields and a booking log. Check out an old parking meter that was filled with pennies! The first thing you notice is the motorcycle officer on his trusty steed. 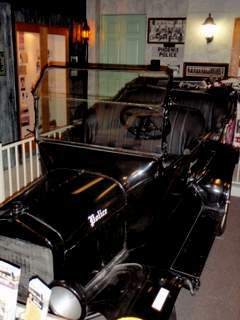 There also is an ancient 1919 Model T police car, with beautiful wood spokes on the wheels. There also is a newer police car that you can sit in. Take a picture of yourself in a police car. Front or back seat optional. If you sit in the back seat ask somebody to take your picture. Be nice to the person who takes your picture--there are no door handles on the inside to let yourself out! This is a picture of the first jail. Surprised? 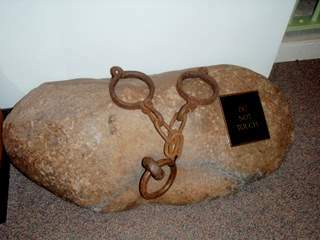 It is just a river boulder that had shackles made by the blacksmith to hold up to two people. What kind of crimes would get you in these? The usual, people would get put in these for being drunk and disorderly. Or maybe letting chickens run wild, because they could cause a horse to spook and throw the rider! Then there is a room in the corner dedicated to those in the department who gave the ultimate sacrifice. It is hard to keep a dry eye when you remember these people are gone in the line of duty. Next time you tuck your kids safe in bed remember these people are out there to make us all safe. 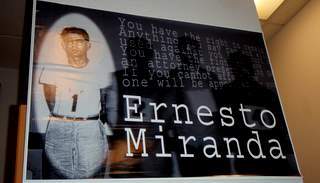 The most historically significant part of the museum is the picture about a guy from Phoenix named Ernesto Miranda. The story starts when a young female employee walked home from the Paramount Theater (when the Paramount Pictures film company owned it). 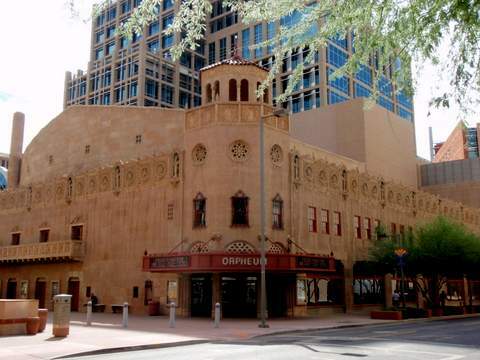 The theater is now called the Orpheum. Find out what happened to the employee in a reenacted film that is for sale and also viewable on the museum website. You will hear the detective talk about how he solved the case. And how he got the confession. Even though the Supreme Court threw out the confession, find out how the prosecution was able to retry Miranda. You will hear which articles of the Constitution that were used. After Ernesto Miranda was released from prison he'd autograph cards that had the verbiage “You have the right to remain silent….” If you have one of these cards the museum would be very interested in getting one! Here’s a picture of Miranda from the police lineup. 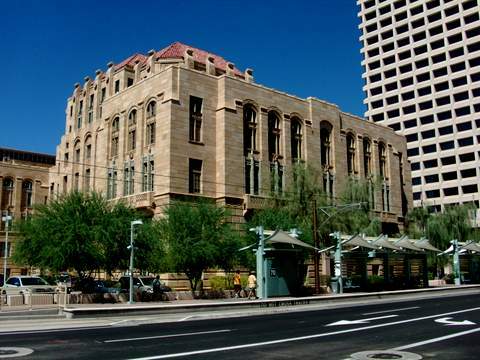 The address for the Phoenix Police Museum according to their website is the Historic City Hall in downtown Phoenix. The Metro Rail goes right by it.